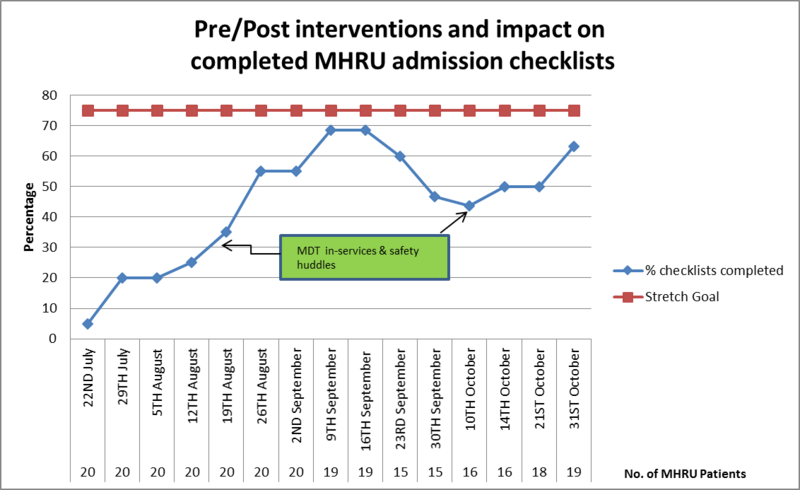 Sutherland Hospital Mental Health Rehabilitation Unit (MHRU) implemented new policies and processes for managing admissions, then educated staff on the changes. To increase the number of admission checklists completed within seven days of admission to Sutherland Hospital MHRU, to 75 per cent by November 2016. Standardises the admission process for mental health consumers. Ensures the needs and priorities of consumers are recognised and addressed during the admission process. Increases patient safety and communication between healthcare teams and with consumers. Allows healthcare teams to address any health or social issues (such as homelessness) effectively and in a timely manner. Aligns to the Patient Safety Program work stream ‘Communication at Transitions’. Reduces length of stay (LoS) and health outcomes for mental health consumers by planning for discharge at point of admission. The Admission, Discharge and Transfer Checklist is a mandatory tool that must be used by mental health inpatient units. It aims to enhance communication and coordination between healthcare teams from admission onwards, to ensure consumers receive high-quality care that is safe and addresses their needs. Effective use of the tool can reduce the consumer’s LoS in hospital and provide a more comprehensive and holistic approach to care. An audit conducted at Sutherland Hospital MHRU in July 2016 found that sections of the admission checklist were not completed for the 20 admitted consumers. At the time, 50 per cent of consumers in the MHRU had a LoS over 100 days. The lack of standardised documentation and extended LoS had the potential to negatively impact consumers’ health outcomes and increase costs to the healthcare system. It also led to increased wait times for consumers to be admitted, which delayed access to treatment and impacted the efficiency of the mental health service. The audit identified that the questions generally left blank were those closer to the end of the form. These questions were supposed to be completed by the admitting nurse, however allied health staff were also responsible for completing these sections of the form. It was determined that improving compliance with the mandatory admission checklist would allow healthcare staff to identify issues early and reduce the risk of an extended LoS. This required a change in work culture and other internal barriers to compliance. gain feedback and solutions from MHRU staff. Allied health team members were asked to support nursing staff during the admission process, with the aim of rapid referrals to allied health. This provides 30 minutes for the admitting nurse to complete the admission checklist and ensure all tasks for admission are completed. The team approach also ensures that the patient’s needs and goals are considered and that discharge planning is started from the point of admission. Admission forms were moved closer to the nurse’s station and responsibility for compiling admission packs was allocated to nursing staff. Responsibility for emailing MHRU care coordinators to meet with the consumer and complete the admission checklist within seven days of admission was allocated to the admitting nurse. Prior to the project, admission forms were completed in the nurse’s station, where there were frequent disruptions such as phone calls and questions. The process of completing the admission checklist was moved to an interview room, to increase privacy for the patient and minimise disruptions experienced by admitting nurses. This increased the likelihood that the checklist was completed accurately and in full. review of care reviews working party. The number of admission checklists completed within seven days of admission increased from 0 per cent in July 2016 to 75 per cent in October 2016. The initial goal of the project was met, however there were low admission rates during this time because of low discharge rates. The number of consumers with a LoS over 100 days reduced from 50 per cent in July 2016 to 35 per cent in November 2016. Completion rates of admission checklists peaked at times when in-service education sessions were held, highlighting the effectiveness of this solution. An updated version of the checklist was developed and circulated from February 2017, as part of policy change to improve completion of the admission checklist. The frequency of audits was reduced from weekly in 2016 to monthly in 2017, with the aim of further improving results moving forward. The aim is to improve ways of working, to support the consumer and start planning discharge from the point of admission. There is a need to address the workplace culture that devalues the admission checklist as an important tool. This was an identified barrier that the project team will continue to address through ongoing education and modelling behaviour. The in-service education provided to staff was an effective way to raise awareness of the project among staff. Ongoing communication within the team and visual prompts of completion rates may have contributed to a more sustainable change in practice. Using the Driver Diagram was a valuable resource to help project team members implement future quality improvements focusing on patient safety. Cheng Q, Greenslade JH, Parsonage WA et al. Change to costs and lengths of stay in the emergency department and the Brisbane protocol: an observational study. BMJ Open 2016;6:e009746. DOI: 10.1136/bmjopen-2015-009746. Cheung A, Somers JM, Moniruzzaman A et al. Emergency department use and hospitalizations among homeless adults with substance dependence and mental disorders. Addiction Science Clinical Practice 2015;10:17. Gilbody SM, House AO, Sheldon TR. Outcomes research in mental health Systematic review. British Journal of Psychiatry 2002;181(7):816. Ithman MH, Gopalakrishna G, Beck NC et al. Predictors of length of stay in an acute psychiatric hospital. Biosafety Health Education 2014;2:119. Jacobs R, Gutacker N, Mason A et al. Determinants of hospital length of stay for people with serious mental illness in England and implications for payment systems: a regression analysis. BMC Health Services Research 2015;15:439. Jones A, Bowels N. Best practice from admission to discharge in acute inpatient care: considerations and standards for a whole system perspective. Journal of Psychiatric and Mental Health Nursing 2005;12:642-47. Moore G, Gerdtz M, Manias E et al. Socio-demographic and clinical characteristics of re-presentation to an Australian inner-city emergency department: implications for service delivery. BMC Public Health 2007;7:320. DOI: https://doi.org/10.1186/1471-2458-7-320. South Eastern Sydney Local Health District (SESLHD). Admissions to Acute Mental Health Inpatient Units (including Direct Admissions for Community Managed Consumers). Business Rule SESLHDBR/059. Caringbah NSW: SESLHD; 2016. Tulloch A, Khondoker MR, Fearon P et al. Associations of homelessness and residential mobility with length of stay after acute psychiatric admission. BMC Psychiatry 2012;12:121. Williams P, Csipke E, Rose D et al. Efficacy of a triage system to reduce length of hospital stay. British Journal of Psychiatry 2014;204:480-85. DOI: 10.1192/bjp.bp.113.141051. Wright N, Rowely E, Chopra A et al. From admission to discharge in mental health services: a qualitative analysis of service user involvement. Health Expectations 2015;19(2):367-76.